Thank God I logged 15 miles this week along with weight lifting! This is the most consistent I’ve been since I had my baby. My goal is to lose at least 8 pounds by December 7th. Having a timeline is important to me because I thrive when I have incentives and deadlines. I haven’t decided on how to commemorate the weight loss. Probably should get a gift certificate to Bath and Body Works and go on a pampering spree. That sounds great to me! I was pleased with the free 7 day workouts they gave us in the gym before we actually joined. The place supplies what I need and it has the best hours around. I look forward to working out there throughout the fall, winter, spring… you name it. I am cooking better meals. 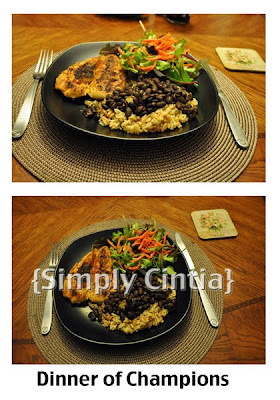 Last night we had grilled chicken breast, black beans, rice and salad. My goals this week are listed at the bottom of this post. Along with those, my aim was to log at least 3 miles walking, running or at the elliptical. I now want to run 3 miles (already ran 1 non-stop) and once I get there, I would like to increase my mileage. 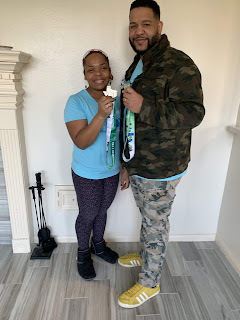 My dream is to run a 10K, a half marathon and 1 marathon (Chicago). Why Chicago? I watched an awesome documentary about it. And it’s one of the flatter ones out there (smile). This weekend we are set to have lots of family time. I loaded up on British series (I am in love with ‘Bramwell’) and I intent to get one more workout in probably tomorrow. Thank God for this week and thank you Zeke for making the executive decision that we weren’t going to wait til January 1st to change our eating and exercise habits. What a great advocate and supporter! Have an awesome weekend everyone!